Daeseong Kang did his DTS in 1997 in Korea and in 1999 joined the M/V Island Mercy, a Marine Reach vessel. On the ship he met his wife Rowena who is from Philippines. They got married in the year 2000 and now the Lord has blessed them with 3 boys and 1 girl. They came to Fiji in 2002 and are still here to this day. Daeseong is leading the Ministry of Marine Reach Fiji and Rowena works as a dentist and Outreach Coordinator. 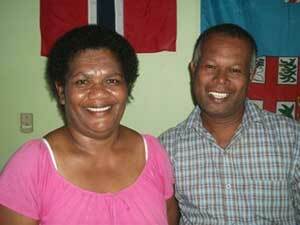 They both love to serve the people of Fiji and beyond the Pacific who are in need in physical and spiritual aspects. Bula, we are Ben and Kaba. We joined Marine Reach Fiji in July 2002 as cook for DTS schools. In April 2007 Ben and I were led by the Lord to attend a DTS. After our school we both became full time staff members and worked with the Mobile Medical Ministry and teams. We have been on staff for many outreaches and DTSs. Charlie and Angie both come from Fiji and completed their DTS in 2012 with Marine Reach Fiji here in Lautoka. Since that time they have been serving faithfully in their local church, involved in worship leading and youth. In 2015, they join as a full time staff engaging in our DTS and hosting teams. They have four young children, Elijah, Joshua, Isaac and David. Bula! My name is Meli Rokovu and I have been with Marine Reach for a few years, volunteering with the medical outreach doing sterilizing and anything that needs to be done. I felt God calling me to do a DTS in 2016. After completing my DTS, I joined Marine Reach as staff. Some of my responsibilities around the base include hosting outreach teams, leading worship, driving the medical truck and teaching mekes (Fijian dances). I grew up in England but went to university in Wales where I met my husband, Peter. We lived in North Wales for over 20 years where our son David was born and my niece Lythan came to live with us. We then went to live in Stavanger, Norway in 1998 where we settled into Norwegian life and David went to school. Peter died quite suddenly of cancer in 2011. We still miss him very much. My church in Stavanger is a non-denominational, English speaking church. I was Sunday school teacher there and also liked to sing in the choir. I love nature and being outdoors and enjoy looking at rocks and anything that can be found on the beach. My work was as a geologist in the oil industry. When I retired I decided to move to Fiji in October 2016 to help at Marine Reach. I have enjoyed working with the team here and enjoy the challenge and the work we do for the Lord through the medical outreaches and the discipleship and bible training courses we run or host. I love living and working here in this ministry and I’m excited to see what God has in store for Marine Reach Fiji. Marcos Cruz is from Brazil. Feeling called to missions after high school, he did his DTS in Goiania, Brazil in 2008, joined YWAM as a full-time missionary in 2010, then did his SBS (School of Biblical Studies) in Curitiba, Brazil in 2012. Subsequently, he worked as staff at the SBS until he felt God calling him to the South Pacific. Toward that end, he began studying English and it was in a short English course that he met Kimberley. Kimberley is from the USA and worked as a nurse for thirteen years. Also feeling called into missions, she started doing short-term mission trips outside the USA in 2013. Marcos and Kimberley married in 2016, and went to New Zealand in 2017 where Kimberley did her DTS at Marine Reach, Tauranga while Marcos worked as ministry staff. 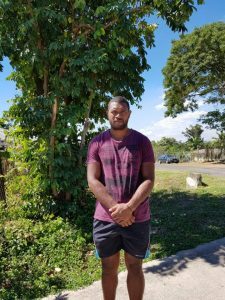 In 2018, after the birth of their daughter Sophia, they felt God calling them to Fiji and were approved to come at the beginning of 2019. They are excited to have arrived and to begin serving alongside the Marine Reach staff to show God’s love to the people of Fiji.